Published on August 30, 2011 by Wade Shepard Follow me on Twitter here. I watched as a travel companion was short changed once in India in 2007. I was a couple steps too far removed from the situation to step in, and though I 99% knew what had happened a 1% glean of doubt was created by the vendor, and I could not justify jumping over the counter and bashing his skull. But from this point on I set my sights on devising a strategy to prevent against being shortchanged myself. The most common short changing graft usually revolves around a vendor providing a customer change for a smaller denomination bill than they paid with. So if you try to buy something that costs $5 with a $20 bill, the vendor will give you back a five dollar bill as though you paid with a ten. If questioned, the vendor will generally just say that you paid with a ten, and if you are not absolutely positive that you handed over a twenty it becomes difficult to fight for all your change. In this scenario, the vendor banks on you just handing money over as a rote action without full mental focus on what you are doing, or, in the case of travel, that you can be made to believe that you confused notes that are unfamiliar to you — both actions are all too easy to do. Well, maybe I really did hand over a $10, maybe I’m mistaken? Sorry, thank you very much. 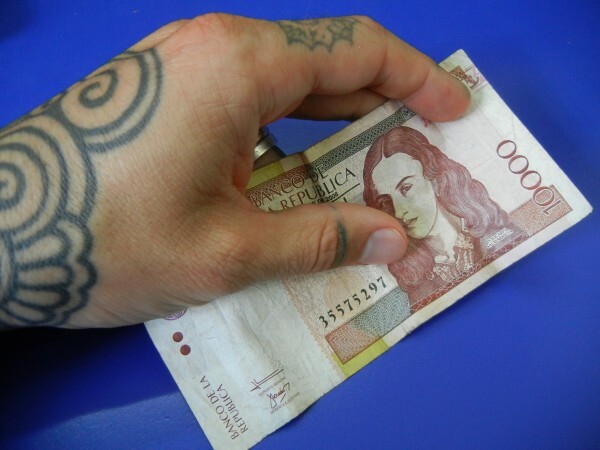 A lady tried to short change me a few days ago at a tourist attraction in Colombia. I paid 19,000 pesos for tickets with a 50,000 peso bill. The lady asked if I had a 1,000 note to accompany the 50 — as though she did not have a 1,000 peso not herself to make change — and I handed one over. After a brief delay, she then laid a 2,000 note in my hand and acted as if the deal was done. She adds some smokescreen by digging in her purse and putting entrance bracelets on myself, my wife, and kid. I stood there waiting for the rest o my change with the 2,000 note still readily visible in my hand. My wife made to walk through the gate and into the attraction, the lady selling the tickets made to walk away from me as well in the other direction. I called them both back, proclaimed that I paid with a 50,000 note and needed the rest of my change. Not surprisingly, the lady automatically produced 30,000 more pesos as though it had been her plan to give me my change all along. She was truly a slick ranger, and, I’m assuming, a successful one as well. Tourists generally have so much bouncing around in their heads due to the new surroundings, commotion, and pursuit of entertainment, fun, and leisure, that they are too easy targets to short change. But what if this lady had not returned my change, what if she asserted that I paid with a 20 rather than a 50? What could I do? Punch her in the face? Stand there yelling for three hours? Kick and scream? Sit and pout? It is of absolute pertinence in travel to have a strategy to inhibit someone from trying to short change you in the first place. After watching a friend being short changed in India in 2007, I used the following simple method without problem. The situation that I cite above in Colombia, I oddly passed on employing this strategy, and perhaps came close to paying the price because of it. There is a reason they do this, as a verbal confirmation of a monetary exchange helps usurp any errors on the part of either party, and helps to keep everyone honest. If you do mistake a 5,000 peso bill for a 50,000, this also helps to keep you from thinking you were short changed when you weren’t, as it gives the vendor a heads up that you mixed up the bills, and they can quickly inform you of your error. A verbal confirmation of the dollar amount you hand over in a transaction is a “same page” check between customer and vendor — and keeps both parties fully aware of each other’s actions. I do not make a show of doing this, I do not hold the money up as though I expect the other person to short change me, I don’t put on a stage show. No, I do it in one fluid motion as though this is a normal way of paying for something. Although I’ve done this hundreds of times in front of my wife I highly doubt she has ever consciously noticed it, and I highly suspect that unless a vendor is planning to short change me or is otherwise insecure they don’t notice either. Short changing generally works on the premise that the customer is handing over money as a rote action, that the denomination of cash they are handing over is not in the upper tiers of their consciousness, that they are side tracked or thinking about something else as they pay, that they can be fooled into believing they handed over a smaller denomination bill than they really did or that they misread the numbers printed on the bill. Oh, silly me, I thought I gave you a twenty. By simply and smoothly making a verbal announcement of the denomination bill that you hand over a counter shows that you are aware of your action, that you are paying attention to what you are doing, and inhibits a vendor from thinking that you can be fooled into being short changed. Tourists are short changed because they believe an illusion rather than their own memory. This happens all the time and most don’t even realize it. A new type of stimulation is inherent to travel, it is the stimulation of the unfamiliar. Far more little things — the visuals, the sounds, the people around you, new languages, figuring out a new money system — abound in travel which titillates and occupies the mind and acts as great diversions for slight of hand tricks. When traveling, a simple show that you are aware of your actions and are familiar with the local money will keep the short changers at bay — or at least you will be able to bash their skulls with due confidence. Brilliant simple tip, Wade – thank! Though I’ve done it sporadically in the past, I now plan to use it consistently so it will be rote when I hit Vietnam. That is a good country to use this tip in for sure! Looking forward to hearing of your experiences there. Good advice, the way Rob proposes is a nice one too. What do you usually do when you receive a lot of change money? Do you take your time to count it or take it as it is? @Uzuoma Well, if it’s just change and I’m not in a country where coins = mid-size monetary denominations, I often will just glace check it to see if it appears to be enough. I’m not that obsessive as to count out every penny 🙂 But this also depends a lot on the culture. I find that I count my change less diligently in a country like China than I do in India.